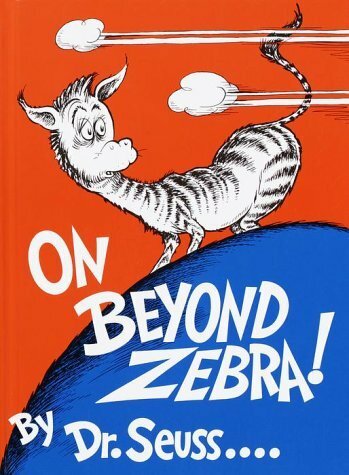 In his ceaseless quest to inspire readers to push their imaginations as far as possible, Dr. Seuss uses On Beyond Zebra to question the possibility of letters in the alphabet beyond the letter Z. It dares to imagine letters like “nuh” and people known as “nutches” and caves called “nitches”. On Beyond Zebra! is an illustrated children's book by Theodor Geisel, better known as Dr. Seuss. This book fits into the genre of literary nonsense. The young narrator, not content with the confines of the ordinary alphabet, invents additional letters beyond Z, with a fantastic creature corresponding to each new letter. The creatures include favorites such as the Floob-Boober-Bab-Boober-Bubs, large buoyant heads which float serenely in the water. These naturally serve as the example for the letter "FLOOB".